“…The operation will include the construction of three 138′ wide by 720′ long barns, two 138′ wide by 1,600′ long barns, and one 138′ wide by 560′ long barn which will house the confined animals. The existing 150′ wide by 325′ long bam will be used for equipment .or other uses, not as an animal confinement area. A 90′ wide by 720′ long barn will be constructed as a: manure storage structure. The existing 82′ wide by 70′ long building will be expanded to a 255′ wide by 183′ long building that will be used as the beef processing center as well as an office. The existing 36′ wide by 192′ long commodity bam will be used to store feed for the cattle. Proposed animal numbers are 6,999 finishing cattle, including steers and heifers. Cattle manure will be stored onsite within the buildings, which will be cleaned out when storage is maximized, as necessary, or when manure is needed to be either bagged for commercial sale or applied to fields that will receive the manure as a fertilizer…” – a letter, from Terra Technologies to a resident of the Lone Jack area, dated January 30, 2018. 1600 feet is just over three tenths of a mile. 6,999 cattle? That’s a lot of manure. Interestingly, there’s a pro-CAFO sign on the south side of U.S. 50, west of 7. This confined animal operation began about a year or so ago with approximately 500-600 head of cattle (as some were verbally told). Valley Oaks would like to expand that to 6,999 – that number is important because it makes this operation a 1B CAFO with self-reporting and inspections every 6 months vs. a 1A operation of 7000 + head of cattle which has different regulations including odor regulations. Because Johnson County is an Agri-Ready county, the health dept cannot impose any health ordinances that limit or restrict agricultural operations(even though our opinion is this is a corporate “factory farm” – not agriculture. 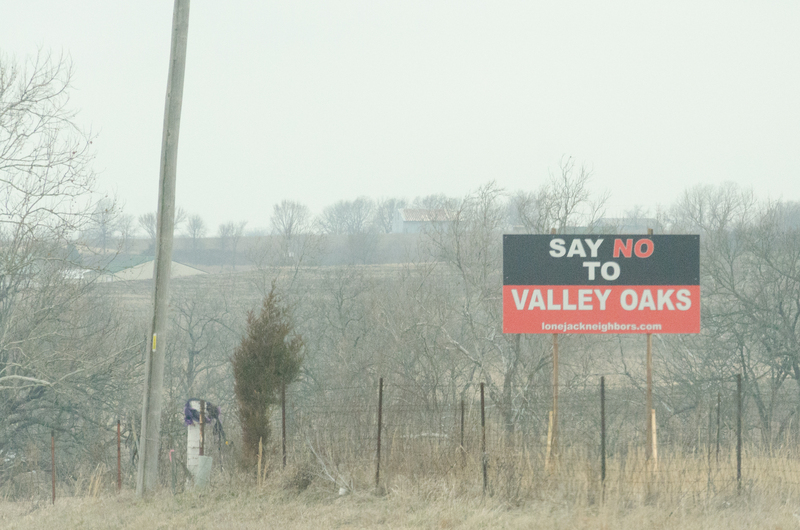 In addition, the MO Supreme court has decided that no CAFO is under any zoning regulations. Even if Johnson County MO (where the corporation actually operates) had zoning, it wouldn’t matter. The Econ. Dev. corp of Johnson county believes this is good for the county. The commissioners have told us to just get used to it. What we don’t think they understand is that this isn’t in the “country” as many of us understand that definition. It is surrounded by 100+ homes – many of those families are raising children. We are talking approximately 400+ people living within 2 miles of this operation to the east and north. Many more are also affected. There are family farms surrounding this facility. This isn’t your typical family farm. This is a corporate farm, factory farm, feedlot, slaughterhouse, meat market, and proposed retailer of bagged manure all in one spot. When one neighbor was finally notified of the permit to DNR for the corporation, they started going door to door, informing nearby residents of the action. In response, we have tried to educate ourselves on the impact of this CAFO. Comments are allowed up until the public hearing to Mr. Greg Caldwell with DNR. We have accomplished obtaining a public hearing from DNR and it will be held from 6 to 8 p.m., on April 3, 2018, at the Warrensburg Community Center, 445 E. Gay St., Warrensburg. That was probably a big mistake on their part. There are a number of comment letters and e-mail [pdf] on the CAFO addressed to the Missouri Department of Natural Resources. The vast majority are negative. The Lone Jack Neighbors web site also includes a notice letter, a flood plain map for the expansion of the CAFO, and a 1.5 miles from Proposed Buildings Map. Powell Gardens is to the east of the operation. It looks like we’ll be covering a public hearing in Warrensburg on April 3rd.